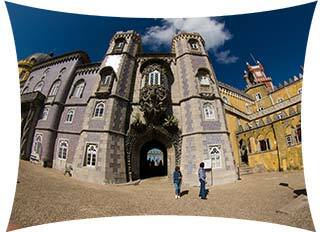 ABOVE: A distortion-corrected fisheye view of the Palácio da Pena's main courtyard. INSET BELOW: A staircase inside the palace walls, and a castle-style duck house in the Parque da Pena's Valley of the Lakes. Portugal's Pena National Palace is located on a rocky ridge above Sintra, a thousand-year-old town on the outskirts of Lisbon. It's one of several palaces in the Sintra Hills, which were awarded UNESCO World Heritage status as a "cultural landscape" in 1995. 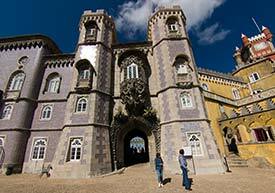 The Palácio da Pena and its surrounding park are billed as "a consummate specimen of Portuguese romantic architecture." The palace, which was built from 1842 to 1854, is a riot of building styles that range from Moorish to pseudo-medieval. It occupies the site of a Hieronymite monastery that had fallen into disrepair after the Great Lisbon Earthquake of 1755 and Portugal's outlawing of religious orders in 1834. Don Fernando II, king consort to Queen Dona Maria II, bought the defunct monastery in 1838. The cloisters were repaired and incorporated into a new royal summer residence. The architect, a German mining engineer with a fondness for castles, must have felt that he'd struck gold when Don Fernando commissioned him to assemble a millennium's worth of architectural motifs under one roof. Impressive and whimsical as the palacio may be, its setting is equally stunning: 500 meters above sea level, on a rocky promentory that looks purpose-built for a castle. ABOVE: Commuter trains run frequently to Sintra from Lisbon's Rossio Station. INSET BELOW: A Moorish-style minaret, and a station platform sign for Sintra. 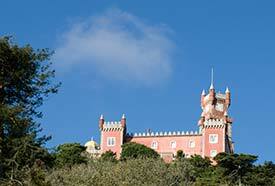 The Palace and Park of Pena are open every day except December 25 and January 1. Hours vary with the season, but the park and palace are normally open daily from mid-morning until late afternoon or early evening. The site is closed on December 25 and January 1. 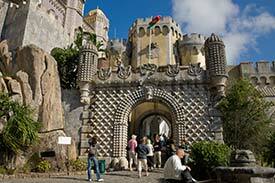 For up-to-date information on hours, prices, and tours, check the official Parques de Sintra Web site's Park and National Palace of Pena pages. 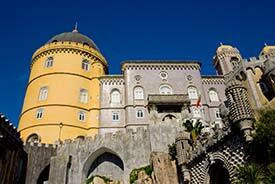 The Palace and Park of Pena are about 4.5 km or 3 miles from the center of Sintra. 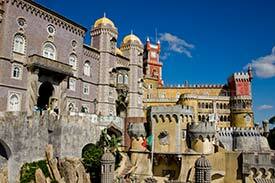 Tip: Passes from Eurail and InterRail are valid on CP (Portuguese Railways). 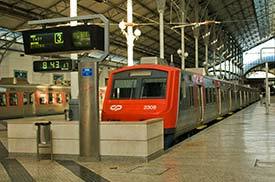 The Lisboa Card also covers transportation on Lisbon's suburban commuter lines. If you don't have a pass or card, buy an inexpensive 4-zone ticket in Rossio Station. Local transportation in Sintra: Scotturb bus 434 (Circuito de Pena) runs between the Sintra railroad station and main entrance to Pena Park. Or, if you don't mind walking, follow the marked pedestrian path to the Moorish Castle and the Park of Pena. ABOVE: A massive entrance gate (lower right portion of photo) leads into the palace. See the official Web site's "Park and National Palace of Pena" for current opening times, ticket prices, guided tours, etc. in English. The Pena section also has virtual visits of the parque and palace. This illustrated article is fairly short, but it has photos and a history of the palace. This site's content is a bit skimpy, but the link to an Ourplace photo slide show is worth a click. 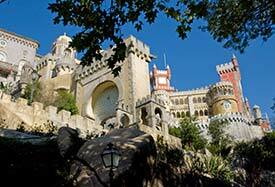 From the 16th Century porter's lodges and tourist facilities at the bottom of the hill, the Pena National Palace shows a bubble-gum pink façade to visitors. A path leads up the hill to the palace. (If you'd rather not climb, you can take a trolley-style bus.) Just beyond the main palace gate is a courtyard with WCs, a café, a gift shop, and a ticket office. Within the castle grounds is yet another entrance gate. Dom Fernando II's coat of arms is carved into the archway. Once you're inside the castle keep, you'll have several areas to visit--among them, the gateway of the Creation with its half-man, half-fish Triton figure between two mock medieval towers. The palace's architecture is a mishmash of styles, and while it rivals Germany's Neuschwanstein for kitsch, the overall effect is far more romantic and human in scale than at Ludwig II's Bavarian fantasy castle. The Manueline Cloisters are the oldest part of the palace, dating back to the early 1500s. 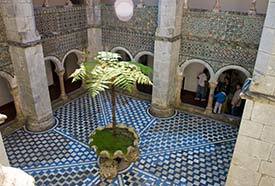 The tiled walls and courtyard have strong Hispano-Arabic influences, and the adjacent Arab Hall (built in 1854) continues the Moorish theme. 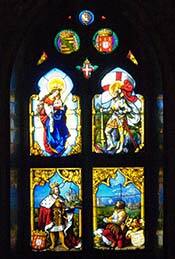 Nearby, the royal chapel (a remnant of the Hieronymite monastery that preceded the palace) has German stained-glass windows that were added in the 19th Century. 1st inset photo copyright © Josep Pena Lorenz. 2nd inset photo copyright © Michal Krakowiak.